A while ago I was invited to join the RippinLip Outdoors team. It has been about 3 months now and I must say it is a really great group of guys with some very talented anglers. Bill Kohls is another RLO pro-staffer who lives in western NC. For some time we have wanted to get together and shoot some video on the water. We finally made it happen this weekend, as Bill was kind enough to haul his Ranger, outfitted with a Mercury 115 and Minnkota trolling motor, to Durham. This was a nice treat since my shoulder injury has kept me out of the Coosa lately. We were intent on chasing bass on Jordan Lake, since it is only 20 minutes from my house. However, a major cold front was pushing through - dropping temperatures from the 60's to the low 40's in just 2 days. Bill arrived on Friday night and we spent some time game planning for the next day. For us, that means looking over a lake map and finding areas we thought would have warmer water, spawning flats, and good pre-spawn areas. After a few hours of sleep we were up again and headed to Farrington Point. We launched behind about 40 boats who were getting ready to fish the "Fishers of Men" tournament there. After getting our gear set, we headed for a rip-rap wall adjacent to a spawning flat. The air temp was about 45 degrees and water temp in the high 50's. I picked up my Carolina Custom Rods deep cranker paired with a Shimano Curado 200 DPV. The lure of choice was a Lucky Craft Moonsault CB250...in a secret color! On my second or third cast I felt a good strike, but the drag on the reel was set too loose and I was struggling to get my act together. Thankfully, the glass blank helped the fish stay on the hook, I cranked down the drag, and lifted a brute of a fish into the net (thanks for the assist Bill). It would be the start of a very good day on Jordan. We worked down the rip-rap bank with no bites, so we turned and started fishing back down it. As soon as we got to the spot where we landed the big fish earlier, we were hooked up again. The spot was on a 3-4 ft depth change with a little pocket and within 20-30 minutes we landed 3 more. Bill landed a 13" bass on a small crank and I landed a 14" and 15" bass on the CB250 and a Deep Creek Lures coffin bill crank. At that point we wanted to check out some other areas, thinking the bass were biting everywhere. We headed to a couple of creeks, but after a little scouting found that the areas weren't what we were looking for and water temps were too low. 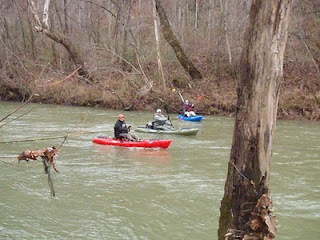 We then motored into Brush Creek where there were numerous boats crappie and bass fishing. We talked to a friend of Bill who was fishing a jon boat tourney. He said he got 2 early, but the bite had since been slow for him. So, after some more scouting and filming (we are putting together a promo for RLO) we headed down lake. We fished a couple areas with little success before finally pulling up to a dock in 8-15 FOW. After fishing it pretty hard, Bill tossed his shakey head under the dock with a lizard rigged on it. He got a good bite and lifted a 14" fish to the net. We then went back to fishing rip-rap walls, but the weather was turning. The high pressure system was upon us, wind was picking up, and temperature was dropping. After 30 minutes or so at our next spot, Bill nailed another 14"-15" bass on a deep diving jerkbait. Then we spun around to the other side of the rip-rap wall and were marking a lot of fish. However, they were not interested in our crankbaits or jerkbaits and were slowly moving into deeper water. I picked up a spinning rod with a texas-rigged Deep Creek Lures 6" floating worm tied on. It wasn't much longer until I felt that characteristic 'tap, tap, tap' and it was on! Another 14" fish in the boat. And about 10 minutes later, I landed another 14"-15" bass doing the same thing. At this point we were freezing and decided it was time to take a few pictures and head home. Never have 15" bass looked so small compared to the brute in with them. This was also the point where I proved that I am kayak fisherman by trade, as my skills with a boat trailer were pretty laughable. 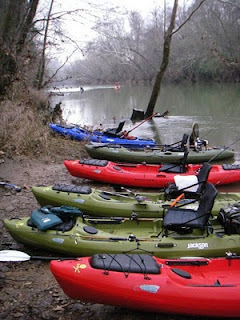 The next day we awoke to 32 degree temperatures, so we decided to wait until about 10:15 AM to hit the water. We knew the fish would be deep and looking for warmer water. To make a long story short, we tried a lot of spots, marked fish, but just couldn't buy a good bite. Around 2:30 PM we decided it was time to call it a day. As Bill left to get the trailer I told him, "I am going to catch one from that corner while you are gone." He laughed, as I was completely joking, but he did have a small bite there earlier, which he suspected was a bluegill. I picked up my Deep Creek Lures 6" worm again and tossed it toward some small rock. I felt a bluegill pick it up and had to laugh. I moved the bait a few inches, then a few inches more. Suddenly, wham, I had a fish! Smiling from ear to ear I landed a 14" bass while sitting in the boat parked at the dock. I waited a moment and hoisted the fish into the air as Bill pulled up with the trailer. I was laughing and he was in general disbelief. He turned the trailer around and started backing it down the ramp. I took one more cast and as soon as it hit the water "bam" another fish! This one fought like crazy and ended up measuring 15+". At this point I am sure my smile was as big as it could be and Bill got out of the truck to throw a few casts. Unfortunately, that was it, but it kept the skunk away! We both agreed that we wasted some time in some tough areas that day and should have went with our gut and just found the warmest water possible that fished to our strengths. Either way, it was a great weekend of fishing and filming. Thanks again Bill for supplying the ride! Next weekend, I return the favor as we team up to fish the RiverBassin Tournament Trail stop in Charlotte...from kayaks! Tight lines! I was able to sneak out for about an hour and a half last night to fish for white bass with my friend Paul McCall. Paul landed a nice white before I even showed up - a fish around 1.5 lbs or more. After moving upstream a ways, I got one of those strikes that simply stops your lure in its tracks. The fish was fighting his way up and down river as I tried to guide him around logs and rocks. He was giving my ultra-lite set-up all it could handle. Finally he was tiring, but the bank was steep and muddy and I was worried my 4 lb test would break if I lifted him to shore. So, I carefully worked him down river, reaching my rod around trees and briar bushes, until I got to a spot where I could land him. It was a brute - a fish which I would later find was a male that measured 17" and weighed in at 2 lbs 7 oz on verified scales. 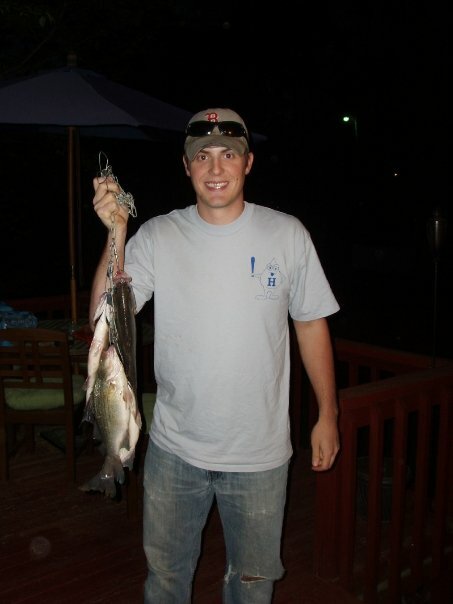 The fish is my personal best NC white bass to date and easily qualified for a NC Trophy Citation. I did catch another giant white a couple years ago, but never officially weighed him. Paul and I caught fish reguarly until dark and ended up with 30-40 when we called it a night. We kept a few to eat - all over 1.25 lbs and most over 1.5 lbs - except one runt that wasn't going to make it. The majority of the fish we caught (and kept) were males, but the females are slowly moving in. It was a great night of fishing and a lot of fun. I am definitely making a return trip before the weekend. Also, I am writing an in-depth article for RippinLip Outdoors that details a lot of tactics, techniques, and patterns for white bass. Keep an eye out on their site later this week for full coverage. Tight lines! I have been working with Carolina Custom Rods and owner Brett Hinson for the past few months to build a rod to my exact specifications. I wanted a 7'6" rod that was made for power fishing, particularly spinnerbaits, buzzbaits, swimbaits, etc. Well, I think we pretty much hit the nail on the head with this one. The blank is a 900 series from Batson Enterprises. Brett fitted it with carbon fiber, foam core split grips, spiral wrapped zirconium microguides, a sweet reel seat, and a black and silver theme. It checks in around 4 ounces...not too shabby. Now I just need to find some time to put it to use! Check out Carolina Custom Rods and he will set you up! Tight lines! Just over a year ago I got a random Facebook message from Mary May. She explained that she was coming to Duke to pursue a nursing degree and masters in nursing in the fall and was contacting me because I was the VP of the Duke Fishing Club and Bass Team. She went on to say that she was an avid outdoorswoman who loved to hunt and fish. In fact, in 2005 she shot 3rd largest non-typical whitetail in Massachusetts history and the largest ever harvested by a woman in the northeastern US. It scored at 198 7/8 with Boone and Crockett and had 15 points with 5 drop tines. Needless to say I was impressed. Over the next few months we exchanged the occasional message related to fishing, Duke, Durham, and a little about us and our rural backgrounds. Little did I know, we would start dating in October 2010 and we quickly got on the water. And, it was evident that she knew what she was doing. This winter we made a few trips in some tough conditions, so the recent warming weather has been a treat for us both. Two weekends ago temperatures were pushing 70 degrees and we wanted to hit the water and catch dinner. Given that I knew the usual places at Jordan would be packed, I looked at a lake map and found 3-4 spots I thought would hold fish and be escapes from the weekend crowds. We launched and spent some time paddling around checking out the bottom on my fish finder. After a couple hours of checking out some new areas we had only a lost white perch to show. Finally, Mary May yelled that she had a fish and as she hoisted it into her yak I could see that it was a good one. It turned out to be a 12" crappie, which went to the stringer. We then went awhile without a bite, while searching for fish. Finally, we came to a spot I thought looked quite promising on the map. It didn't take long before we had a bite - a decent 10" crappie. Over the next 3 hours we caught fish after fish with a keeper rate of nearly 40%. After putting 14 on the stringer between the two of us we started throwing back keeper size fish. As evening set the bite slowed there so we moved to one last spot near the launch. I was marking a ton of bait there and we quickly hooked up with fish. After landing another 10+ fish in about 20 minutes, including a few keepers, we decided to call it a day - as darkness was upon us. Overall, we landed 60-70 fish with the biggest 4 being right around 13". They made for an amazing dinner when we got home. We hit the water again last Friday. It marked one year since she sent me that first message, so we wanted to celebrate on the water. Unfortunately, we only had about an hour and a half. So, we decided to give the pond a try at her apartment complex. We headed down to the small pond and found that it was quite shallow and had a lot of algae. But, within 15 minutes Mary May landed a nice little bass. She also lost 1-2 more that didn't quite get the hook. I went fishless for nearly the entire time until I managed a small bass - literally 5 minutes before we had to leave. It was a fun little trip and a fitting way to celebrate! Then we hit the water again this past Monday. We slept in and got a very late start, so the river I wanted to fish was looking like a long shot. Instead we decided to head back to Jordan to chase crappie. Again, we wanted some solitude, so we went to the areas we had so much luck the week before. We also decided that we would only keep fish over 11.5". The weather was significantly windier than had been forecasted, but we got set up and used the wind to set up drifts over the area. It didn't take long before we had our first few fish - all over 11.5". I lost another at the boat that would have been close to 13". But, that was just the beginning. A short time later I look over to see Mary May's rod bent totally over and I see her hoist a giant crappie from the water. The fish was as fat as any crappie I had even seen. The fish measured a hair under 14" and weighed 2 lbs 4 oz. We kept catching fish, but 10-15 minutes later I heard her drag being pulled. I looked over to see her working on a big fish. What she brought out of the water was easily the biggest crappie I have ever seen in person. As she brought it out of the water the fish gave one last bolt of energy and it broke the line while hanging in mid-air above the front of her yak. My mouth dropped and she screamed in frustration. She was pretty frustrated and I still don't know if she has shaken off losing that fish. We both estimated the crappie easily at 16" and probably over 3 lbs. The first crappie she caught was an NC citation/trophy size fish, but this one was a true giant that was simply mind blowing. We went on to catch a bunch more fish, kept 10 over 11.5", and threw back a lot of keeper size fish including some around 11.5". We probably caught 50 fish in a fairly short day with a lot of fish over 12". And again, we left them biting as it quickly got dark and cold. Hopefully her big crappie wins as part of the KayakBassFishing.com Online Crappie Contest that ends next week. Unfortunatley, it uses length only, but she should contend for a top spot. She is an amazing fishing partner who is pretty accomplished already and learns extremely fast. I can't wait to share more of my knowledge with her and see her progress even further as a fisherwoman. Until next time, tight lines! I have paddled and fished from the Coosa roughly 12-15 times and I must say that I am impressed. I have broken this review into categories, in which I will address the pros and cons. Weather/Conditions: I have paddled the Coosa all winter long, including a couple days with air temperatures in the 20’s where ice formed on the deck. However, I always felt good having extra clothes and supplies in the hull, as the Coosa has a lot of storage space. A friend of mine even stacked his full of firewood and started a nice fire on the river bank this winter. Plus, the Coosa is a pretty dry ride. And I have paddled the boat in light, moderate, and heavy winds. If the boat has a downfall, it is handling in the wind. Wind will, of course, affect any kayak, but the large front end of the Coosa (which allows for better maneuvering and stability) catches a lot of wind. And, I have found that when paddling from the high seat position I got blown quite quickly – roughly three times faster than the 10’ sit-in kayak that a fishing partner (typically my girlfriend/better half) often paddles. Tracking/Maneuverability: The Coosa tracks OK. I was surprised at how well it tracked given its design and handling. But compared to a non-river boat, it will not compare. It maneuvers very well and steers, as I and others have noted, more like a creek boat – with a very responsive front end. 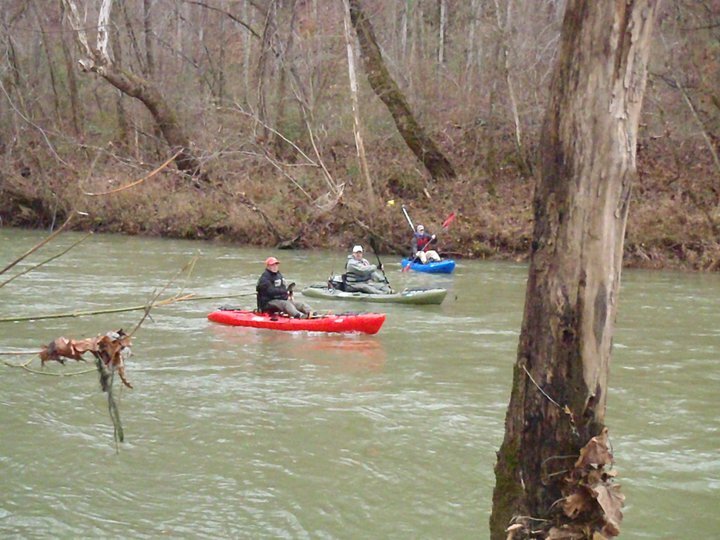 I will note that on rivers, particularly those that are quite rocky, beginning paddlers should be cautious. When sitting high in this boat your center of gravity is quite high and getting caught on shallow rocks can be trouble if you are not experienced. 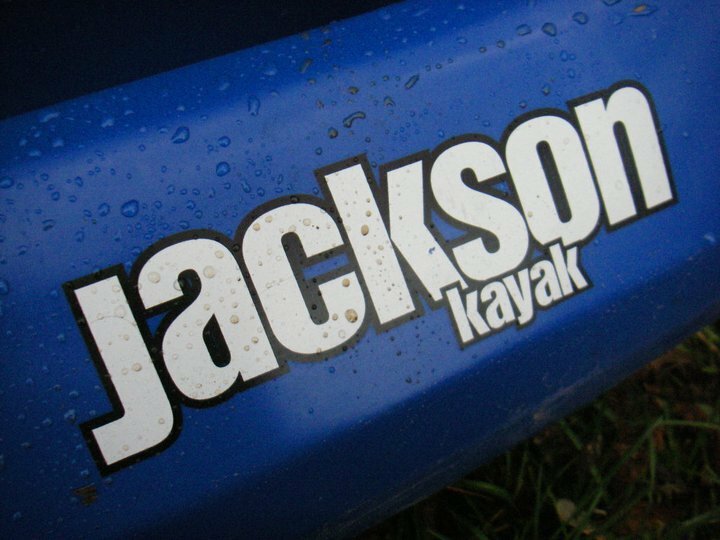 Speed: This kayak isn’t going to win any races. However, I find it comparable to some of the slower sit-on-top kayaks I have paddled before (like the Wilderness Systems Ride 115). It definitely moves faster from the low seat position. And from the high seat position I highly recommend a paddle of at least 240-250 cm length to maximize efficiency and speed. This size paddle will also help when standing. Stability: At 11’3” with 31.5” of width, the Coosa is quite stable. And it is noted for being a kayak from which you can stand and fish. I found that it does take some adjusting, but after I got comfortable it became easy to get up from my seat, stand, and fish while floating. For reference, I am 6’ and 185 lbs. It is also easy to enter the boat from the water; however, I have yet to do so from water deeper than four feet. My first trip in saltwater will not be for another month or two, but on a very windy day on Jordan Lake it handled 2-3 foot waves with ease, so I suspect inshore applications will be a breeze. Weight: The Coosa weighs 63 lbs without the seat, which is removable in the elite model. I have no problem loading the boat onto the roof of my SUV by myself. It is significantly (20 lbs) heavier than my other kayaks, but after a few trips I barely noticed. Features: This yak has A LOT of nice features. First, it has a lot of storage space in the hull and rear tank well. It also has a small pocket for keys, wallet, camera, etc. in front of the seat, room for storage under the seat ( which fits 4 tackle boxes perfectly), and a cup holder (which if you are like me typically just fills with lures). The Coosa has an extremely comfortable removable seat, which inclines to any position. It has paddle holders on each side of the boat and a paddle “stager” in front, which is a notch to rest your paddle and is particularly helpful while standing. It has two flush mount rod holders in the back, two rod stagers on the sides (with bungees), and 3 slots that help to hold rods on the front hatch. Both hatches are also lockable, which is a great feature while traveling, particularly because you can store 4+ rods and other gear in the hull without a problem. One other nice feature on the Coosa is the recess in the back, made for a drag chain (for river guys) or anchor system of some sort. I also have a depth finder transducer mounted in-hull, although you could mount one in a scupper if you desired. The in-hull mount works great because the Coosa has recesses in the deck that are made for Talon and RAM mounts, which make installation of a depth finder easy and keeps the deck clear and free of wires. Now for the grand finale - check out this video filmed with my new GoPro Hero HD this past weekend on Jordan Lake when I met up with Jackson Kayak fishing team member (and friend) Herschel Finch. Overall, I am impressed with the Coosa. It does everything a river boat should do, but is not going to be an all-around boat that everyone likes. The positives outweigh the negatives with this boat and I would recommend it to anyone from beginning paddlers to seasoned vets. I know I can’t wait for things to warm up so I can spend more time getting this yak on the river!